Up until a few days ago, the panic button was on about participating in this month's Thrifty Chicks Challenge. Why? 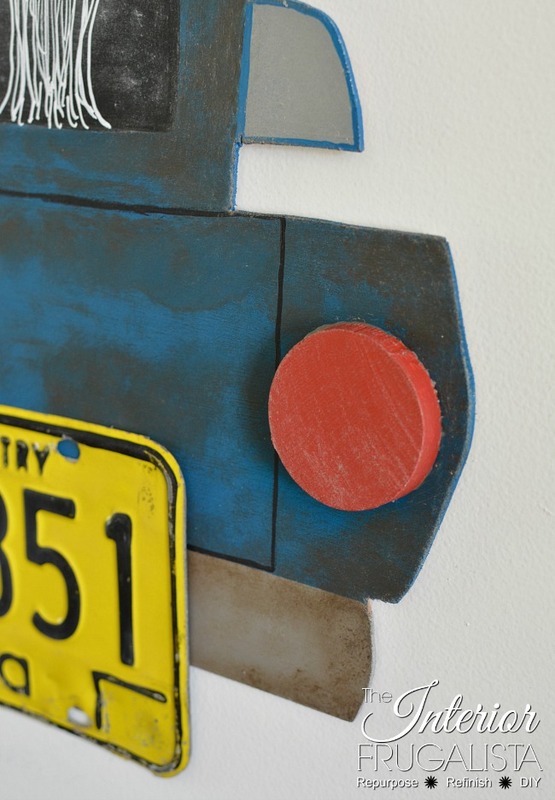 Because the theme is License Plates and for weeks leading up to the challenge I hemmed and hawed about what I could make with an old license plate and every time I drew a blank. The other set back was finding a license plate that didn't cost an arm and a leg. It took a few weeks but we found one for $3.00 at the antique mall where I have a booth. It dates back to the early 80's here in the Province of Alberta. Inspiration finally struck while in the shower. Does that happen to you? I get the best ideas or solutions to life's problems while in the shower. 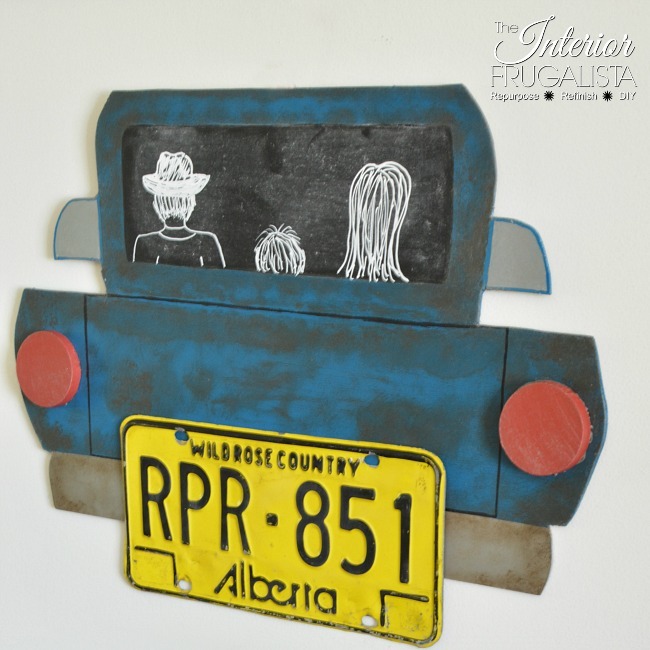 An image of the back end of an old truck came to mind (no I wasn't looking in the mirror at the time) and instantly I knew I had a great idea for License Plate Wall Art For A Child's Room, particularly our grandson's room at Grandma & Papa's house. I ran across the hall to my office and grabbed the first piece of paper I could find to draw a rough sketch. At my age, had I waited until after I got ready, the idea would have long since been forgotten. Does that happen to you too? 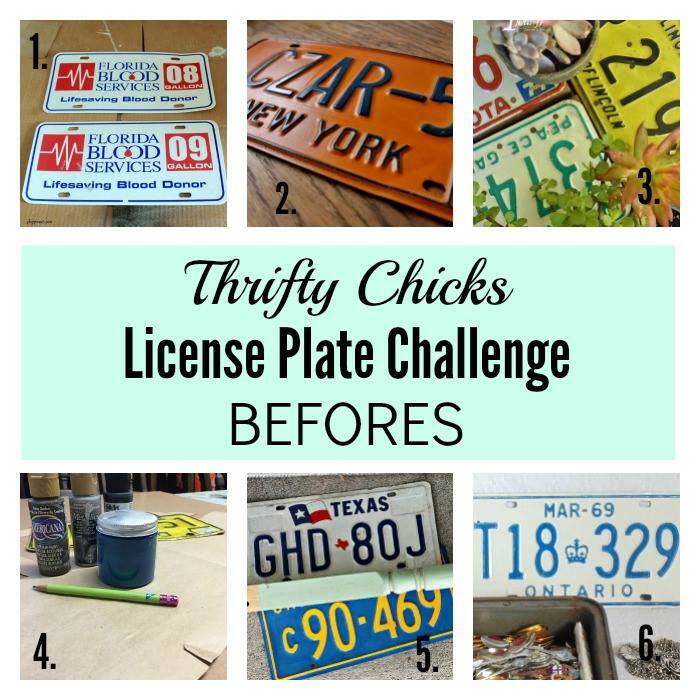 Before I get into the details of how I made my children's license plate art, I should tell you a little about the Thrifty Chicks. 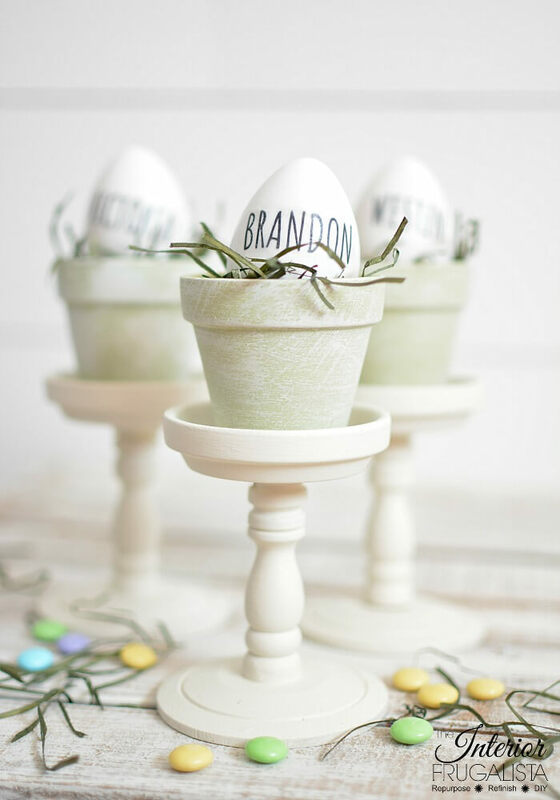 On the second Wednesday of every month, a few of my creative junk loving friends and I come together to transform, upcycle or repurpose a junk find based on a theme. 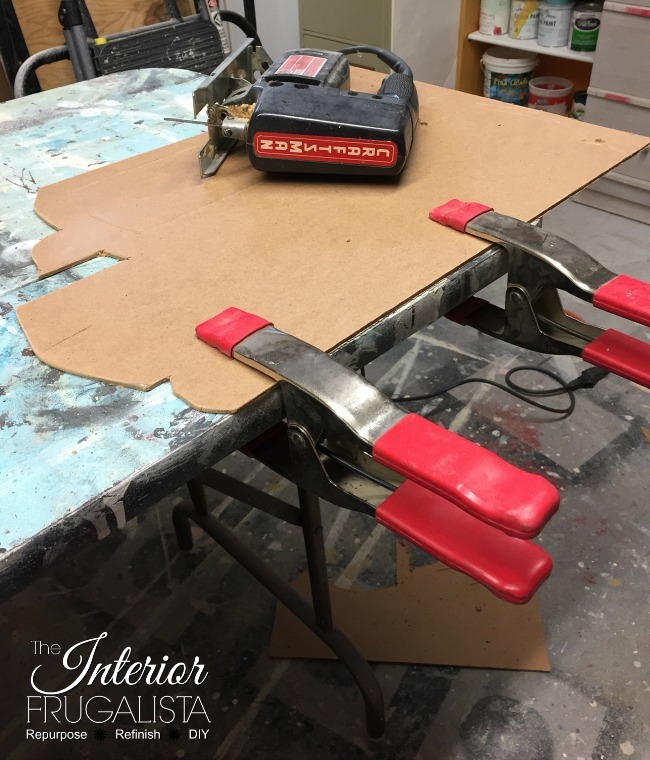 In case you missed them, in June the challenge was Chair and I gave a makeover to two Danish wooden chairs here in my post, Scandinavian Half Painted Chairs. 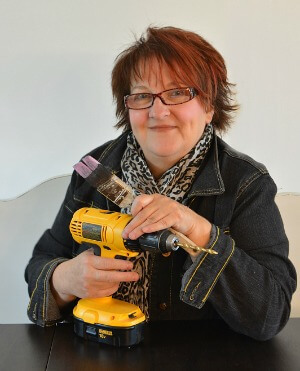 In July the challenge was Kitchen and I turned thrift store cutlery and a sugar bowl into DIY Silverware Wind Chimes. The first task was to create a template of an enlarged version of the tiny sketch I drew after getting out of the shower. With brown craft paper and a pencil, I drew a freehand drawing of the back of an old truck, using the license plate as my guide. 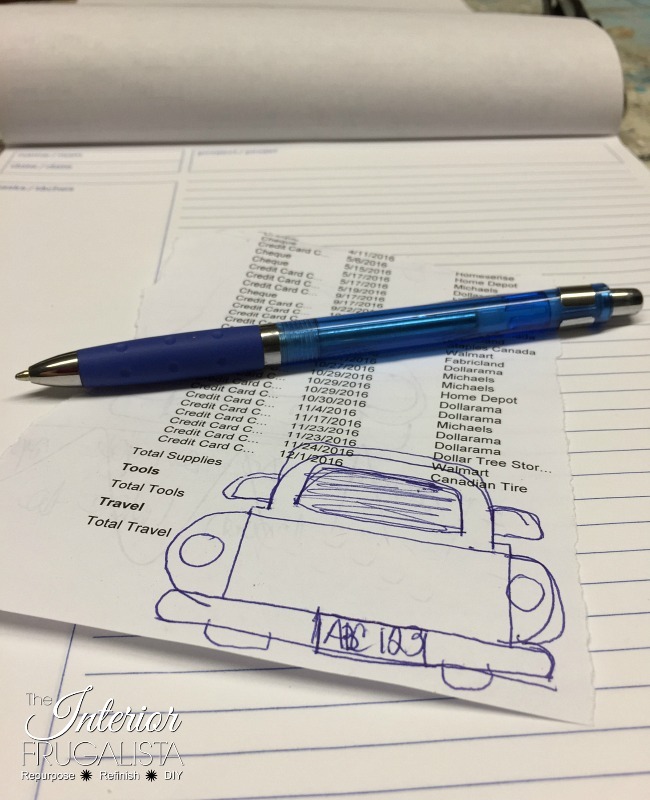 The sketch is not to scale but rather a whimsical childlike illustration of an old truck. For each side of the truck to be symmetrical, I folded the paper in half and cut along the illustration on one side. After it was cut I drew the details on the opposite side. 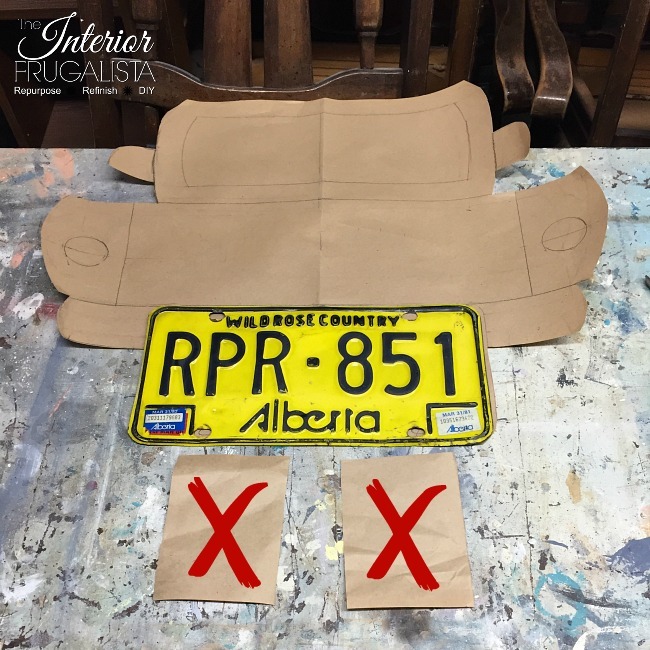 Ignore the paper rectangles marked with an X. I had originally planned on making stained wood plaques to hang from the license plate - much like tin cans hanging from the bumper of a wedding car. I was going to connect them all with wire and decoupage photos of my grandson onto each one. I changed my mind when I realized it would make the art far too big for the wall I planned on hanging it. 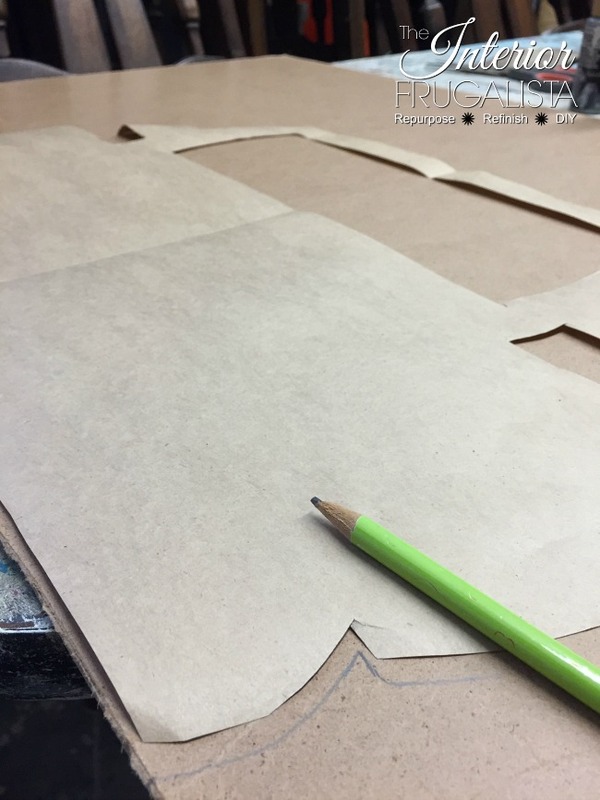 I traced the template with a pencil onto thin hardboard, this would keep the weight of the art light for hanging on a wall. Using our relic jigsaw (Mama needs a new jigsaw), I cut out the wooden template and sanded the rough edges with a mouse sander (another relic in the workshop). Using the paper template as my guide I drew in the details of the truck like the bumper, tailgate, back window and rear view mirrors. Nothing for this project was purchased except the license plate. 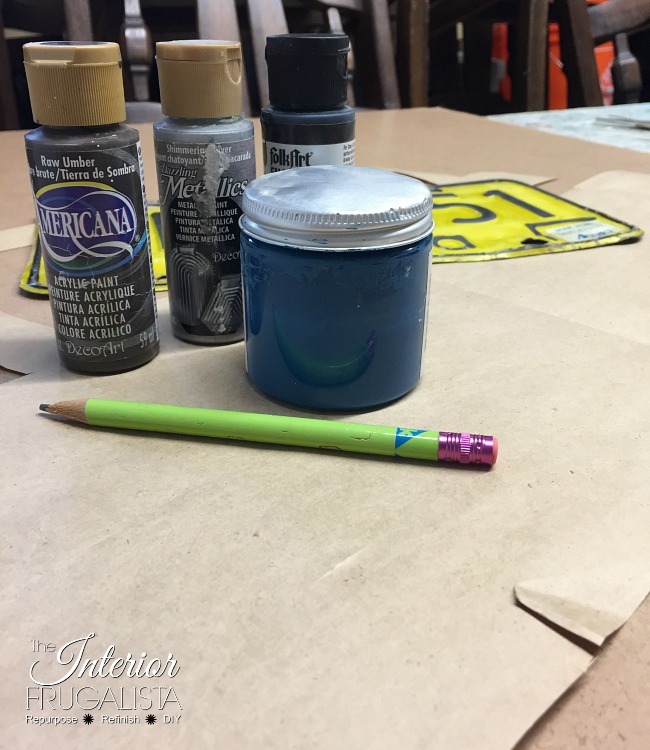 With paint I already had on hand, the body of the truck was painted in the color Moon Dew by Country Chic Paint. The bumper and rear view mirrors were painted with Shimmering Silver DecoArt Dazzling Metallics. With a script liner art brush and black paint, I outlined the frame of the back tailgate. 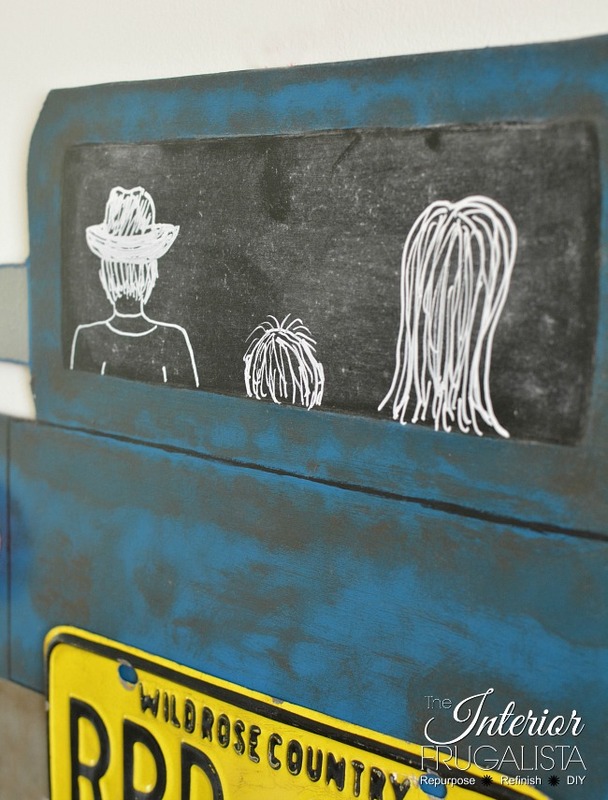 The back window was painted with Craftsmart Chalkboard Paint. The truck was looking a little too new and needed some rust, so I dabbed DecoArt Americana Raw Umber by simply dabbing the color on with a round stencil brush and a lint free rag. 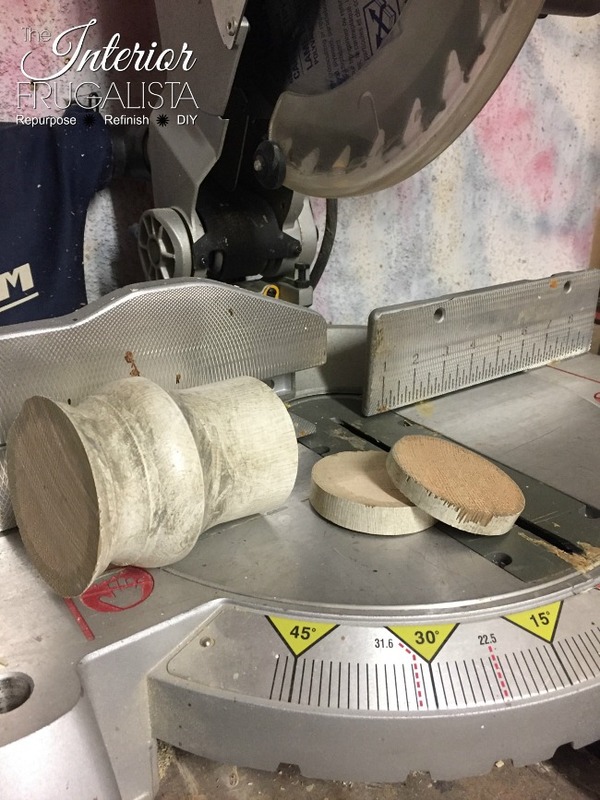 To make tail lights, I had a salvaged top of an old newel post and sliced it into two disks on the miter saw. I painted them Barn Red by Dixie Belle Paint Company and attached them with Gorilla Wood Glue. The license plate was attached with E6000 glue. 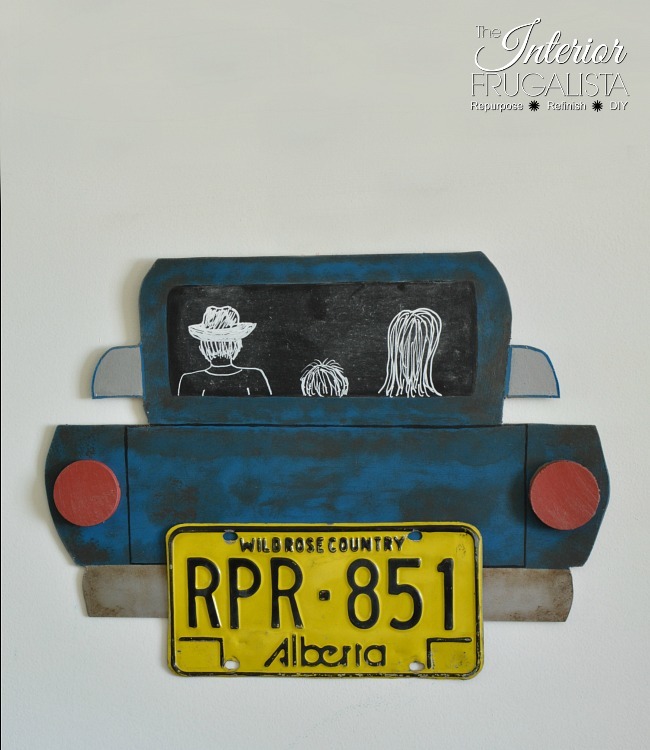 Now the License plate Art was ready to hang in Westin's room but first I attached a sawtooth hanger on the back with a hot glue gun. When you find yourself in a creative slump or stumped on one of life's problems, jump in the shower. You never know what answers will come. 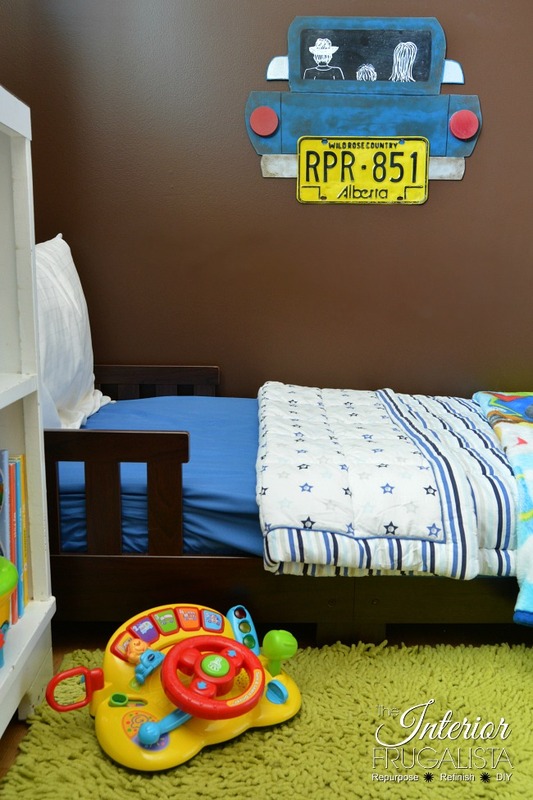 If you like this idea for wall art for a child's room by repurposing a vintage license plate, please share it with a friend and/or save it on Pinterest. 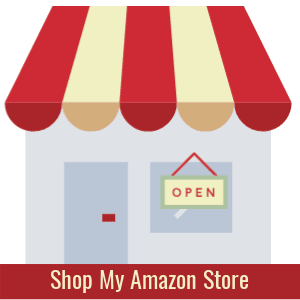 Please join me in visiting my friend's blogs to see what they did with the items pictured below by pressing the links below the picture.